A screengrab from the advertisement. THE ADVERTISING STANDARDS Authority of Ireland (ASAI) has ruled that car brand Kia must change an advert which depicts a man jumping off a cliff while screaming. The ad, according to the firm, was intended to show a man completing his own personal bucket list which included a cliff jump. They said this was evident by another portion of it which portrayed the man, following the jump, placing a tick beside the words Scotland – Cliff Jump. The person who made the complaint said he found the advertising to be extremely disturbing as, before he noted what it was for, he considered that the man was attempting to take his own life. In the ad, he is shown entering the water and swimming to the surface, then climbing up the edge of the cliff. He is then shown walking and then sitting in his car. According to the upheld complaint to the ASAI: “The complainant, who participated actively in water sports, considered that if the advertisement was purporting to promote adventure, then it should have shown the man wearing a wetsuit and using safety gear when jumping from the cliff as this was normally the case for coasteering. The advertisers said that whilst they took on board the complainant’s opinion, they did not agree that this it was in any way encouraging dangerous behaviour or suicide. The ASAI found that it did not consider it was best practice to portray anyone, particularly a person fully clothed, jumping from a cliff feet first into the water below. The body also noted that the man had run at speed towards the cliffs and was not wearing any safety gear and that he appeared to have jumped alone into the water without taking note of rocks or any other dangerous items that may have been present. It ordered that the advert be amended. Email “Kia ordered to change ad which showed man jumping off cliff while screaming”. 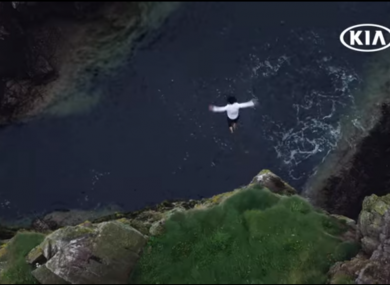 Feedback on “Kia ordered to change ad which showed man jumping off cliff while screaming”.